This is a rectangular Castrol Motor Oil porcelain sign. This particular Castrol Motor Oil sign is red and yellow with a white sash across the middle. 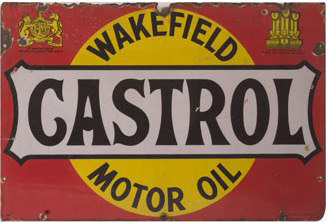 It reads, “Wakefield Castrol Motor Oil” and features a yellow emblem at each upper corner.